Initially released in April 1966, Solitary Man lyrics and music was Neil Diamond’s debut single as a recording artist. The song lyrics describe the disappointment and resolutions associated with young romantic failure. However, the song has also been used to describe Neil Diamond himself . . . . .
“Solitary Man” is a 1966 hit song written, composed, and originally recorded and released by Neil Diamond. It has since been covered many times by a number of other artists. Initially released on Bang Records in April 1966, “Solitary Man” was Neil Diamond’s debut single as a recording artist, having already had moderate, but accidental, success as a songwriter for other artists; their versions of the songs he had already written and composed were released before his own versions of them were. By July, the song had become a minor hit rising to Number 55 on the U.S. pop singles chart. It would then be included on Diamond’s first album, The Feel of Neil Diamond, released in August 1966. “Solitary Man’s” dynamic melody, matched with the melancholic universality of its lyrics, would make the song an attractive target for later interpretations. 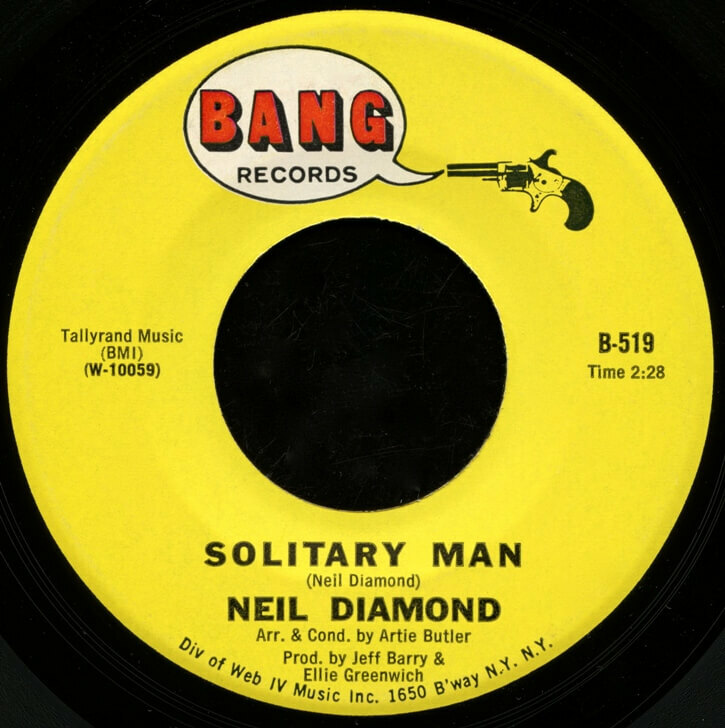 After Neil Diamond had renewed commercial success with Uni Records at the end of the decade, Bang Records re-released “Solitary Man” as a single and it reached #21 on the U.S. pop charts in summer 1970. Neil Diamond originally recorded two versions of the song, as he later did with “Cherry, Cherry.” One version had his harmonic vocal track on the refrain of the song, along with accompaniment by a wordless female chorus. The other version was him singing the song alone, without his prerecorded harmony or the female chorus. Pete Paphides (2006-04-07). “I’ll be what I am. A solitary man”. The Times. Retrieved 2008-05-08.